On Saturday 24th January a group of Corsham children helped Mazy Bartlett, Corsham Outreach Worker, to make a Pledge Tree from re-cycled materials for a new group which held their Launch Event at The Pound Arts Centre in Corsham. 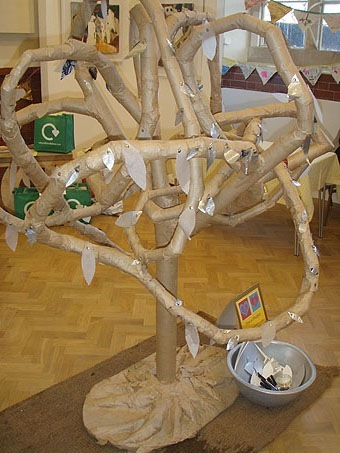 While making the tree out of old cardboard tubes, and creating decorative bunting from discarded materials, the children began thinking about re-using materials and the ways in which we can all be more sustainable. These issues are at the heart of the Transition Corsham Community or TransCoCo for short. The Transition movement started in Totnes in Devon when a group of people got together to think about ways they could reduce their carbon footprint as they were worried about Climate Change and about fossil fuels, like oil, running out. Now there are many Transition villages, towns and communities across Britain, who are doing things to help make their lives more sustainable. Transition Corsham Community is a group of people who got together to do this too and so now we have a group in the Corsham community area – that’s Corsham and its surrounding villages. We have talked to all sorts of local people – teachers, councilors, traders, community workers and residents about what they think they could do. We invited some of these people to the launch event at The Pound Centre last Saturday. The Core Group of TransCoCo worked with Mazy to find out ways in which Corsham children could get involved in the ideas behind Transition. So when she ran her workshop for children at The Pound the children made the bunting and a Pledge Tree for the Launch Event. People who came to the event put their ideas on cut out leaves and pinned them on the tree. Less flying for work – more tele-conferencing. All new houses should be built with solar panels already installed. Get an energy monitor to monitor how much energy I use at home. Plant more trees and don’t knock any more down. I pledge to reduce my heating by 1 degree C.